Sony announced its new flagship phone Sony Xperia Z3. The Xperia Z3 is water resistant and dustproof with IP58 rating. The Xperia Z3 has high screen resolution with Shatter proof glass, Triluminos display and X-Reality Engine display protection. 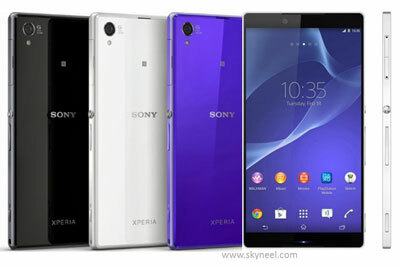 The Sony Xperia Z3 is a Smartphone phone which is available in Nano SIM with 4G facility in Different Color Variations like as Black, White and Amber. This phone uses different chipsets for different variants in 4G versions with Quad-core 2.5 GHz Qualcomm MSM8974AC Snapdragon 801 processors. It has 20.7 MP (5248 х 3936) with auto focus, LED flash facility on the rear and 2.2 MP front facing camera. The Sony Xperia Z3 Powered by Krait 400 Quad-core 2.5 GHz processor With Adreno 302 GPU. The Xperia Z3 has Qualcomm MSM8974AC Snapdragon 801 Chipset. The Sony Xperia Z3 has 3GB RAM With 16GB Internal Storage and the user can expand Memory up to 128GB. The Sony Xperia Z3 has IPS LCD 5.2 inches capacitive touchscreen Display with 1080 x 1920 pixels resolution. Its screen can display 16 million colors. The Xperia Z3 has water resistant and dust proof . This has a X-Reality display and Triluminos display protection. The Xperia Z3 has 20.7MP Rear Camera with 5248 x 3936 pixels. It has autofocus, LED flash and 1/2.3” sensor size, Geo-tagging, touch focus, face detection, image stabilization, HDR and panorama with 2.2MP front facing Camera. The Xperia Z3 is a stylish phone, it has 146.5 x 72.4 x 7.4 mm Dimensions and weight is 158g. Sony Xperia Z3 runs on 4.4.4 Android KitKat. It supports Java and browser flash.The Smartphone has a barometer, Accelerometer, proximity and Maps, Calendar, Google Search, Gmail, YouTube, Google Talk, Alarm, Calculator, Clock, and other Google sync apps. This is power pack with loaded lots of features and apps. Sony Xperia Z3 Smartphone has supports 4G and 3G (GSM) networks, Bluetooth and Micro USB with Li-Ion 3200 mAh battery. 1. Xperia Z3 has high speed quad-core 2.5GHz processor. 2.Xperia Z3 has good rear camera resolution. 3. Sony Xperia Z3 has Tv -Output. 4. Xperia Z3 has high screen resolution. 5. Xperia Z3 has latest android OS 4.4.4 KitKat. 6. Xperia Z3 has waterproof and dust-proof protection. 1. Sony Xperia Z3 has heavy weight.